Have you heard the news? PANTONE 18-3838 Ultra Violet is colour of the year for 2018! This is big news and you will soon see it popping up in the shops on clothes and home decor items, and in the design magazines. 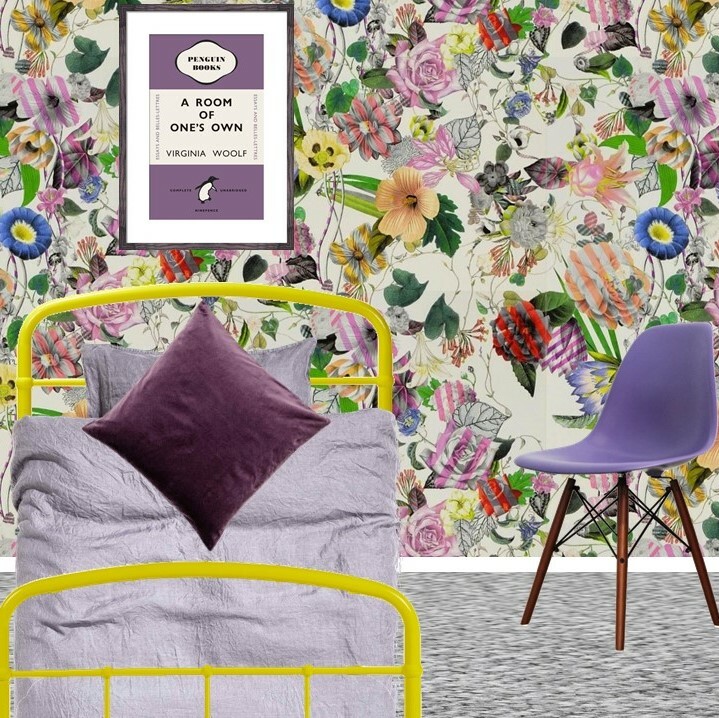 “Inventive and imaginative, Ultra Violet lights the way to what is yet to come.” So here are some room styleboards to show you some ways to use Ultra Violet in your home with items currently available for sale. Tassel garland – (Sorry for the drawing) I picked a seller who custom makes tassel garland and colour matched the drops on the wallpaper (request: green tea, pansy, terracotta, sandstone and beige). 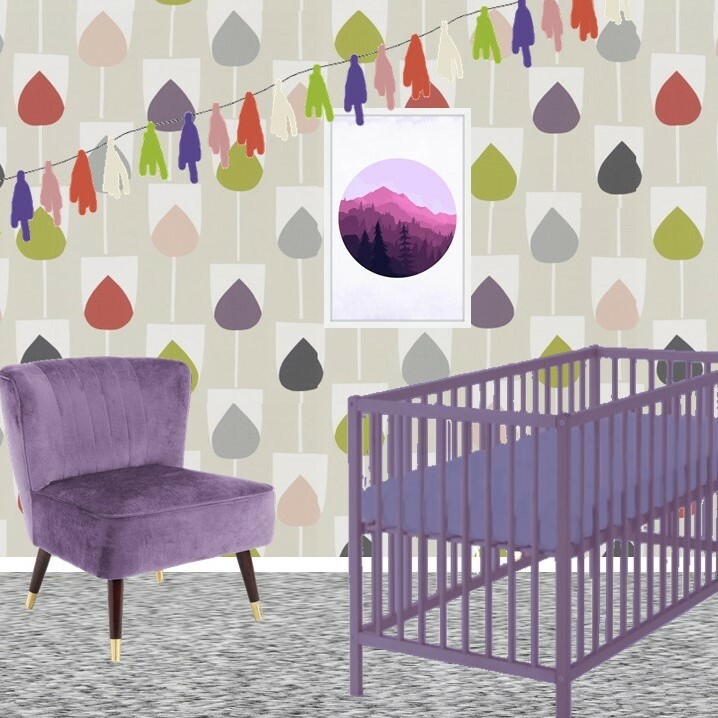 Cot – This is the super budget friendly IKEA SNIGLAR which I’ve shown painted Dulux Purple Pout (the paint version of PANTONE Ultra Violet) but it could be a pre-loved cot painted. Chair – mid century velvet cocktail chair. Wallpaper – Boråstapeter Mardgomma in green. Raised bed – I love this IKEA KURA reversible bed and it lends itself to be hacked. 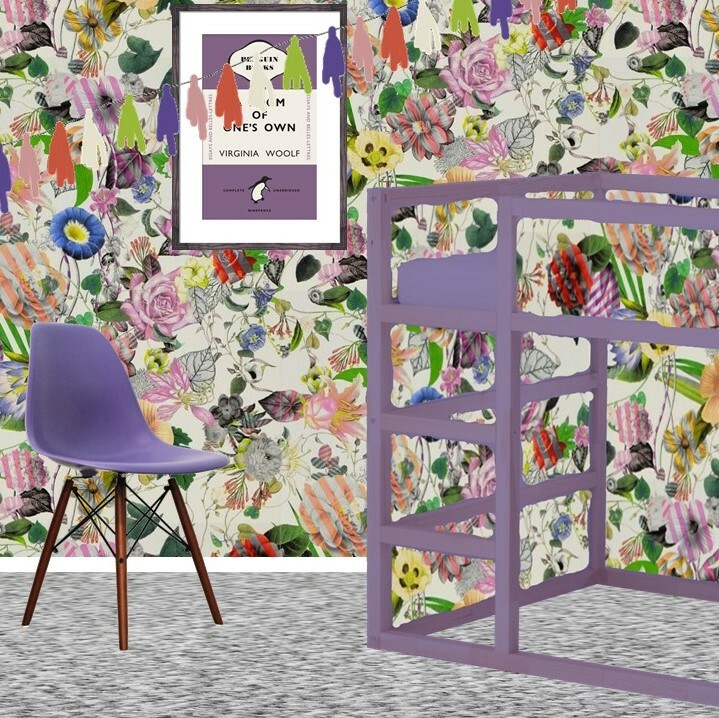 Here it is shown as a raised bed (creating a den underneath), with the frame painted Dulux Purple Pout and the panels wallpapered to match the walls. Chair – Eames inspired chair. 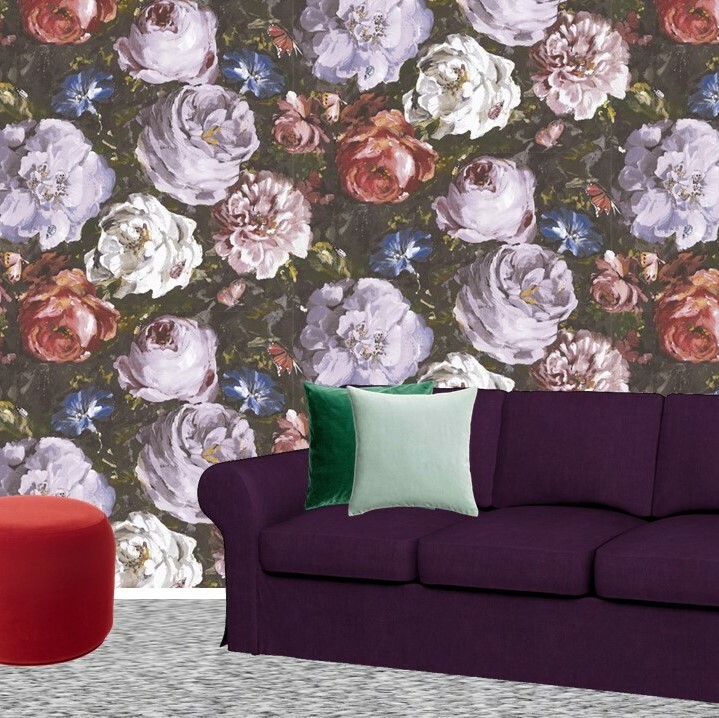 Wallpaper – How stunning is this Christian Lacroix Malmaison in Opiat? Bedframe – Here I’ve shown a simple single metal bedframe in yellow (also available in white, grey, pink and teal) but you could paint a pre-loved bed. Bedding and cushion – If you follow my blog you will know that I love linen bedding from H&M (here it is shown in purple grey). And you can’t beat their cushions, here I’ve shown a velvet cushion in dark purple. 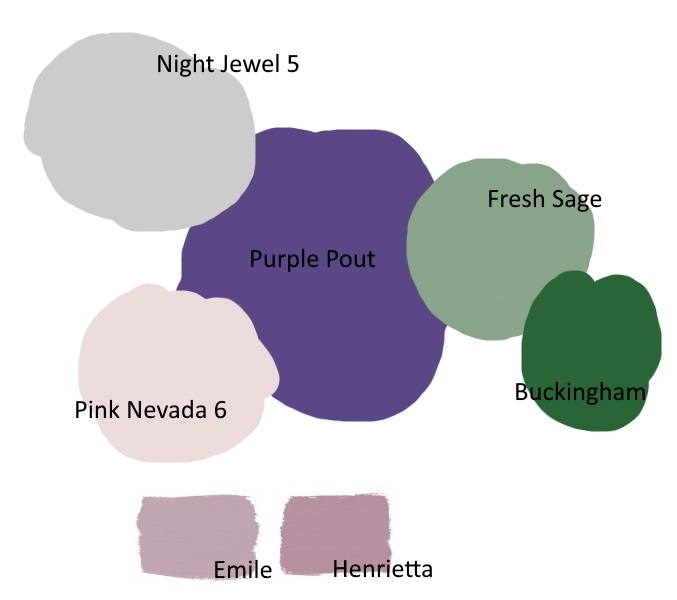 Paint – Main neutral colour is Dulux Night Jewel 5 with an accent panel the same width as the bed in Dulux Purple Pout (the paint version of PANTONE Ultra Violet). Bedding and cushions – As above but obviously here I’ve shown it with double bedding. Wallpaper – Clarke & Clarke Floretta in Heather / Ebony. 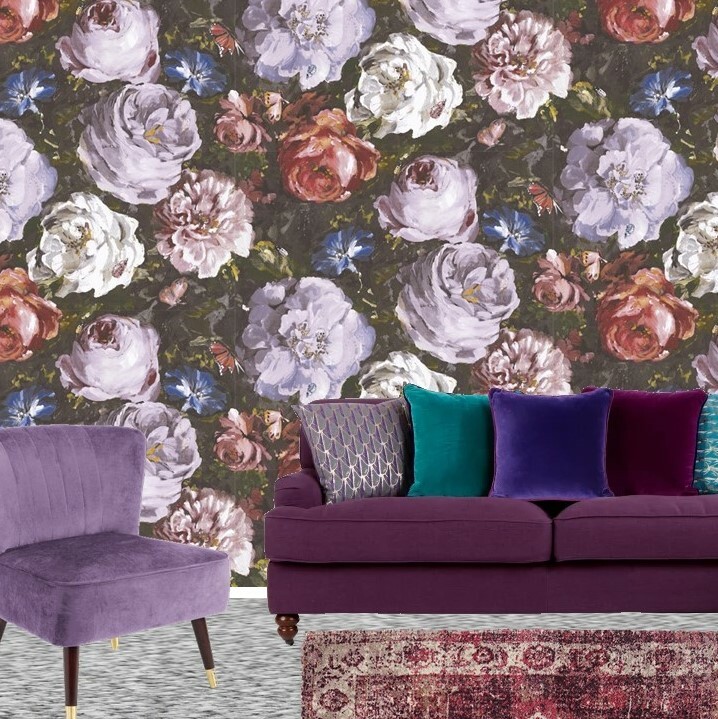 Isn’t this dark and moody floral wallpaper beautiful? 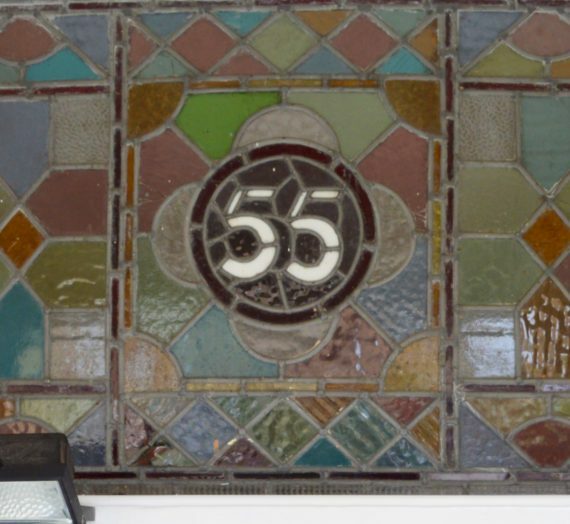 And it’s really affordable at £39.00 per roll. 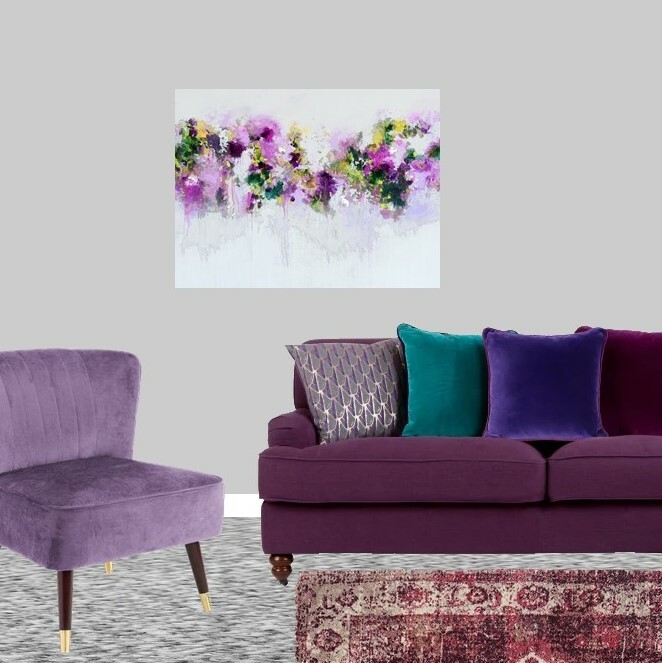 Sofa and cushions – The sofa is from Made, in Pansy Purple. The jewel tone velvet cushions are a great match but you could also use the H&M ones from above in jewel tones. 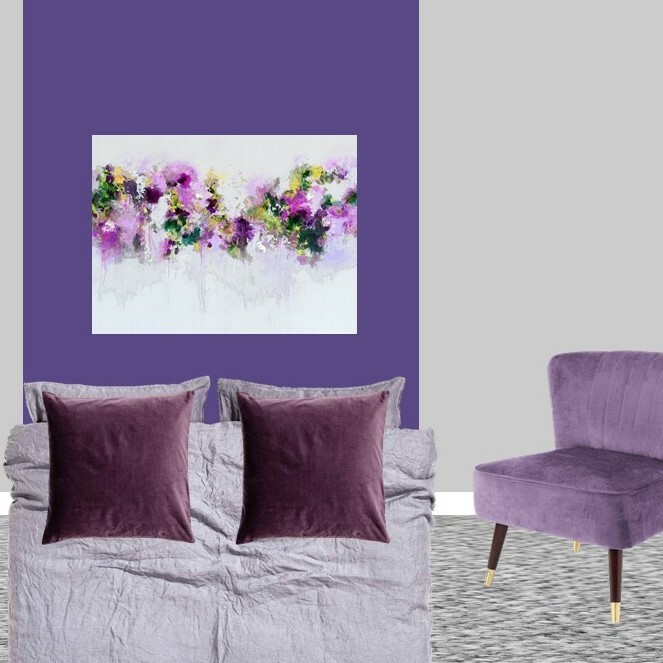 Rug – You can’t beat a Persian inspired rug and this vintage print rug in a purple mix is a great addition to an Ultra Violet inspired decor. 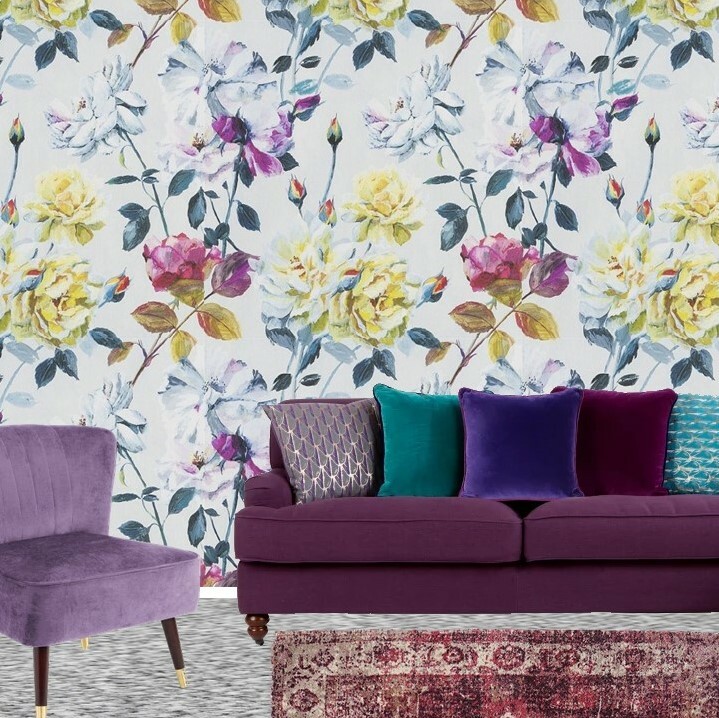 Wallpaper – If you don’t fancy the dark and moody look above, here’s a lighter version with the gorgeous Designers Guild’s Couture Rose in Fuchsia. Sofa, cushions, chair and rug as above. Like a few items but not as I have styled them? Mix and match! 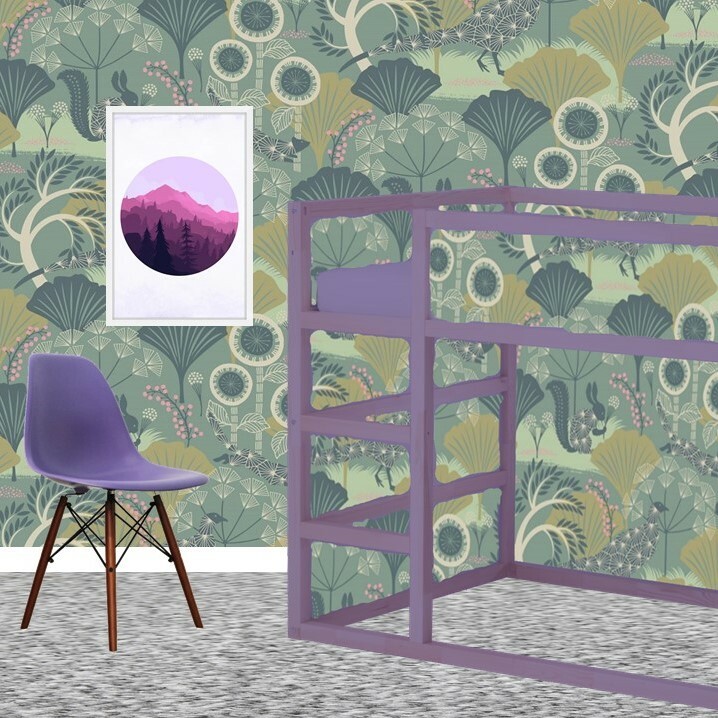 As the palette is the same for these rooms, all based on Ultra Violet, you can mix and match between the items in the rooms. To prove my point here are some mixes. In the spirit of HMP, here’s the dark and moody sitting room from earlier on a budget. 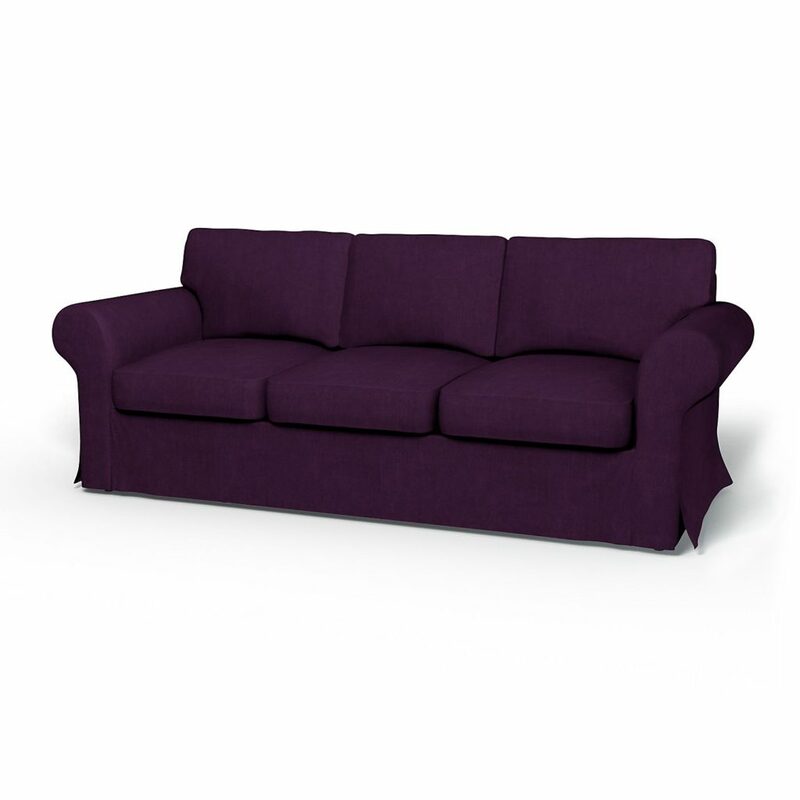 Using Bemz – they make covers for IKEA furniture – I’ve shown the IKEA EKTORP sofa in Brera Lino Aubergine. I replaced the chair with the IKEA STOCKHOLM 2017 Pouffe in Sandbacka orange and velvet cushions from H&M in greens. 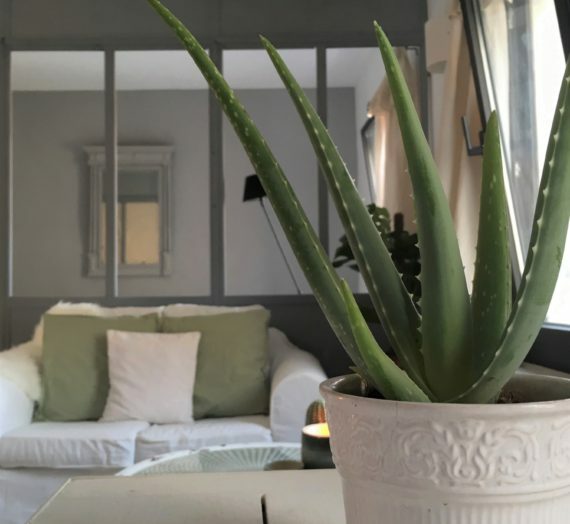 If you want to read more about my paint choices and please click here for my full post about PANTONE colour of year 2018. 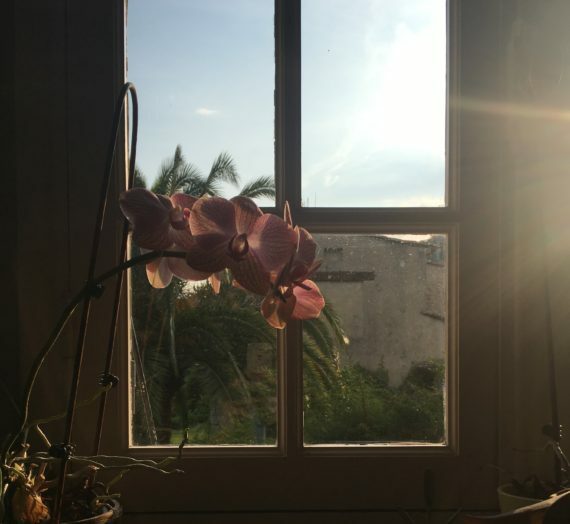 I hope you’re inspired and wishing you an Ultra Violet 2018!